Thinking about where to study? 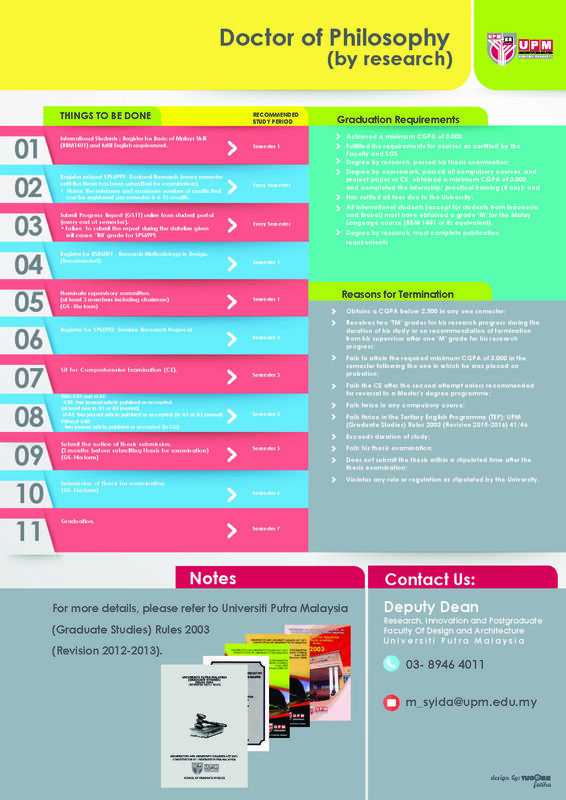 Make your choice with the Faculty of Design and Architecture in Universiti Putra Malaysia. Affectionately known as FRSB, the faculty provides an excellent educational and research environment in terms of qualified teaching staffs, learning facilities and refreshing and beautiful environment nurturing creativity, exploration, and innovation. FRSB thinks designers as playing a role as the creative integrator of various other disciplines. The faculty promotes design thinking approach and trains students to become leaders in the design world whether as design practitioners, researchers, or entrepreneurs. a faculty of international repute in the field of design and sustainable built environment. Please click here to do on-line application. Please click here for research proposal template. 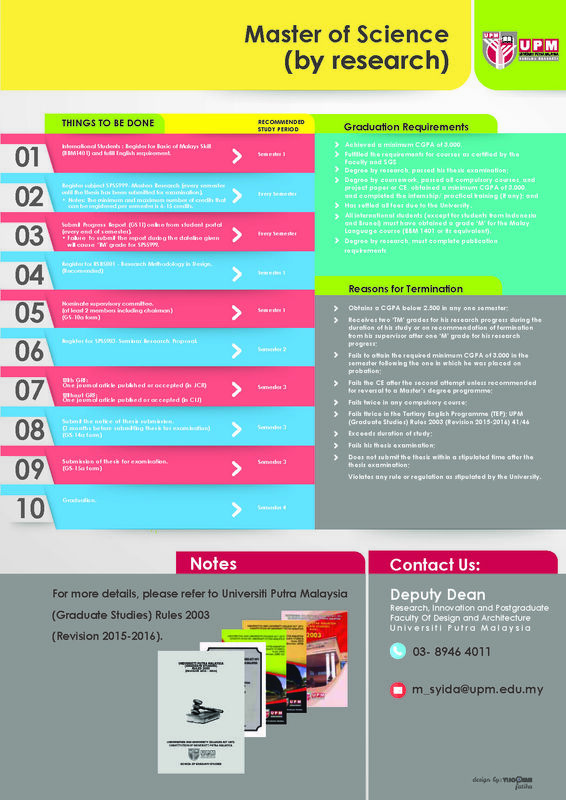 Universiti Putra Malaysia is pleased to announce that a new scholarship, the Putra Alumni Scholarship Scheme (PASS), is now open for application for the academic year of 2016/2017. This scholarship was created to encourage International UPM Alumni and their children to study at the graduate level in UPM as a form of loyalty scheme. FRSB provide all facilities for the students through the process of learning effective and useful. This is to stimulate students to prepare themselves for the world of work is constantly changing and challenging. In addition, students also need to prepare themselves as responsible members of society, are willing to change the society around them, and be able to think wisely. FRSB students are strongly encouraged to be positive and work towards excellence and has a strong and capable of independent life. FRSB have various groups of staff who are well trained, experienced, and dedicated. They consist of a group of academic staff, administrative, and technical. Based on the motto "Excellence Culture", FRSB staff are ready to serve the fast, efficient, and friendly to achieve customer satisfaction, which consists of students, their families and the outside community. Your relationship with the UPM community does not end upon graduation. UPM graduates are welcome to join the UPM Alumni Association, which is dedicated to strengthening the bonds of friendship and networks from a variety of expertise. In fact, many members of the UPM Alumni have been appointed as ambassadors at large for their contributions in their fields, and they have left a big impact on society and the nation and enhanced the university’s reputation at the international level. Since 1971, the UPM Alumni list has grown to an impressive list of 145,000 people - not only in Malaysia, but from all over the world, including Australia, Iran, France, Myanmar and Saudi Arabia. Armed with a desire to foster fraternity with their Alma mater, UPM Alumni have managed to share great ideas and speak critically for the development of a dynamic university in the realisation of our vision and mission. For those interested to find out more information about the UPM Alumni Association, visit the Alumni Centre and the Alumni Association Official Website. KASEL Talk Series 2017 (UNIV 360) - 25 September 2017, Dewan Reka Bentuk, FRSB. Publishing "35 LANDSCAPE ARCHITECT ENTREPRENEURS, PROMINENT LANDSCAPE ARCHITECTURE ALUMNI, FACULTY OF DESIGN AND ARCHITECTURE" book - Volume 1 2017. A total of 97 Sijil Tinggi Persekolahan Malaysia (STPM) arts stream students from three schools took part in the Industrial Design & Motivation Career Seminar organised by the Roadshow Committee of the Industrial Design Department, Faculty of Design and Architecture (FRSB), Universiti Putra Malaysia (UPM).